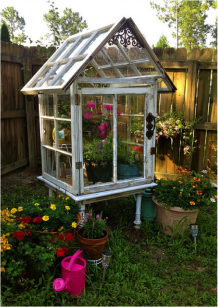 How to Build a Miniature Greenhouse from Old Windows | Global Garden Friends, Inc.
It’s time to get new windows for your house, and you have the perfect ones in mind. But what should you do with the old ones? Before you send them straight to the landfill consider recycling them into a project instead. 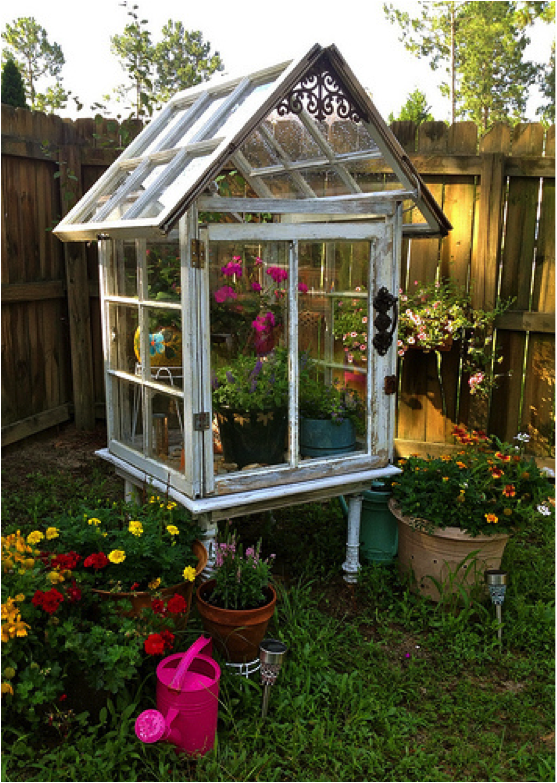 Old windows can make a cute, inexpensive greenhouse that will brighten any yard or patio. You can make a greenhouse of any size, but if you don’t want to go through the trouble of pouring concrete and collecting more than a handful of windows, there is another option. Miniature greenhouses will fit in the corner of an office or a small backyard, and they have the added bonus of being portable. Collect screws, nails, your toolbox, and, most importantly, your windows (you can also use old doors if you’re looking to build a larger greenhouse). Whether you use your own old home windows or salvage them from craigslist, neighbors, or construction sites, make sure that they’re the same size so that you can put them together without the extra hassle. 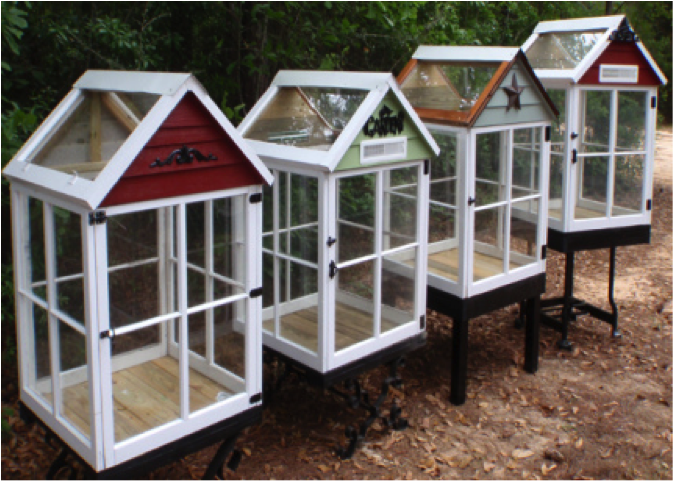 Make sure that they’re all the same material, too—you can build a miniature greenhouse with either wood or aluminum-framed windows, but the job will be much easier if they are all the same. I’ll use wooden frames as an example in this article. Just modify these basic instructions to fit your personal preferences! Before you begin building, make sure that your windows are in optimal condition. Repair them as needed (caulking, sanding, etc.). You might save painting as the final step, just in case they get scratched a little during the building process. Painting the wood will protect it from the elements as well, so don’t skip this step entirely even if you’re going for more of a “shabby chic” look. There is more than one way to go about the building process. Peruse the internet for the best ideas, and choose the design that you like the most. Here are a few options to consider as you get started. If you’re at all like me, the thought of using exact measurements, levels, drill bits, angle irons, and anything that sounds like it belongs to a professional construction worker is daunting. Now that you have a rough idea of how you want your greenhouse to look, here is the most basic way I’ve found to construct your miniature greenhouse. Something like this can take a little more work, but the results are well worth it. Whether you’re looking to replace your windows and doors in Toronto, Los Angeles, or anywhere in between and need to get rid of the old ones or you want to get an early start on your garden with a basic greenhouse, building one from old windows is one solution. Go out and do some research, and whatever style you end up with will be a fun, valuable addition to your gardening experience! Awesome, wish I had any land at all…..in my belief every 25 people should purchase land together and either rotate the farm workload, or lease it to a farmer who will then provide the 25 with all seasonal veges/dairy/meat. I’m sure there are people who do this, just wish it was mandatory. Or maybe a sort of connecting services that hooks you up with people in your area who want this. The numbers can be different and the amount you put in will determine your share, this way anyone could afford it, and actually it should save money! google community gardens in your area! While I love the idea, making it “mandatory”…not so much. Best thing to do is to START doing this and show others how its done. The ground-swell movement of healthy, sustainable food is happening. We who are in the “wave” need to keep at it. That’s an awesome idea! Of ask someone who has land if you could rent part of it and raise cows, or goats or bees or chickens. Share your bounty of honey or eggs or wool with them…. Actually, there are already organic farms where you pay monthly to help with their expenses, then you get produce every month. Perhaps you should look into it. You can also make cook gardens using containers, wooden crates, etc. Where there’s a will, there’s a way – pursue it yourself & forget the mandatory idea! I’m going to start with an 8′ by 20′ and then just as Miss Winchester added a room every year to her mansion, I will ad atleast one window per year. Any body have any really sound tips for framing the windows? That is a neat idea. I think the community lifestyle is awesome. Wish I would have seen this before I sold our Antique windows from our 1937 home.